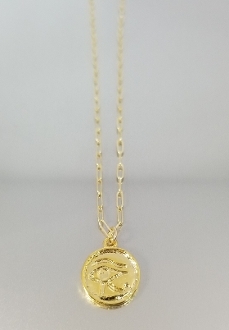 This eye of Horus necklace is set in 14 karat yellow gold and comes on your choice of a 16, 18. or 26 inch 14 karat yellow gold paper clip chain. The Eye of Horus is an ancient Egyptian symbol of protection, royal power, and good health. The eye is personified in the goddess Wadjet.